The RGB STEEL 3D Printer is intended to be a nice looking, low cost, strong carbon steel frame, compact, color mixing, easy to assemble reprap 3D printer. The machine is a redesign of the famous steel frame P3Steel 3D printer, with the advantage that now it can be equipped with a Diamond Hotend that allows for color mixing 3D printing, and lodge at least 5 bowden extruders for even more color mixing. This instructables also servers on how to install a diamond hot end onto any reprep like machine using ramps 1.4 and Arduino Mega. The 3D design of the entire machine is opens source, download and open it using sketchup. All sizes are in 1 to 1 scale. Download the vector file in .cdr and .dwg format and have the parts laser cut on a 3mm carbon steel sheet or similar metal. In order to implement back-light for the RGB STEEL logo, i used 3mm Cristal acrylic panels. The process is simple, you just need to cover the acrylic panels with a red, green and blue piece of thin plastic in order for the white light to turn red green and blue. You than need to power the LED's using 12V from the power supply. Follow the wiring diagram and make all the connections. You will need to mount the MK8 extruders to the top o f the frame as shown in the photos. The MK8 extruders are fixed using 1 screw onto the frame. The filament spool holder was designed to allow 3 spools for filament, but can easily carry up to 5 spools. The Teflon tubes should have the same lengths i used 50cm. So you will need 1.50meters of Teflon tubing. Here are some tips on how to install the Teflon tubing. Download the repetier firmware at the end of this step. Add a multi part object to your print plate and position each part in the correct location. Than assign a color to each part. how would we go about calibrating the 3 extruders? I want to calculate for steps/mm per extuder. would repetier host be able to send command to each extruder? how would i change things to make it a dual extruder instead of a diamond mixing hotend? and is your diamond hotend 12V because i can only find 24V or 6V diamond hotends. Nice Instructables: thanks for sharing. It is possible to enlarge the frame to 300x300? Would 3mm Acrylic work for this project? I have one question on your kit list: is the CNC sheield actually needed? Wouldn't it be possible to directly interface the RAMPS board with the stepper driver? RAMPS only supports 5 (five) engines and to use Diamond it takes 6 engines. Expansion is for this engine. How to connection a cnc shield wiring to Ramps 1.4 .
it is possible to find the file is in dwg to Parasolid? What is the build size of this 3D printer? And would it be better to get the parts and build it or just but it off the site? It all depens on your budget, your time and experiance builing 3D printers. 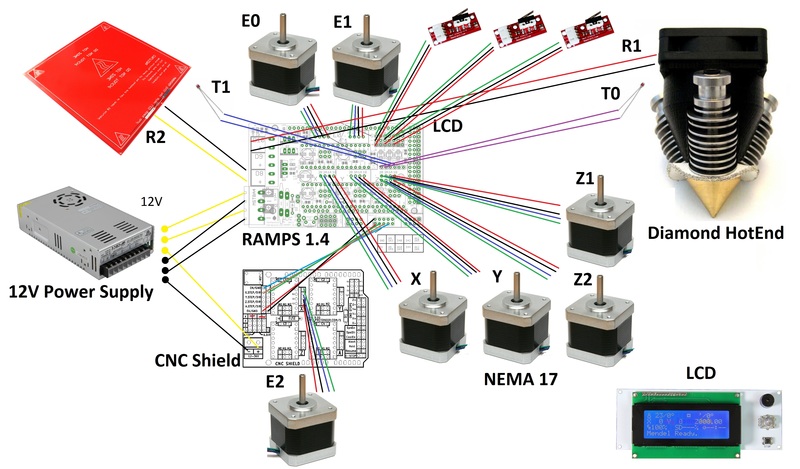 Can you make a clearer illustration about what pins should I connect the components to the CNC shield and RAMP 1.4 board? Hello, the eletronics wiring image is 5512x3228 pixels, just zoom in to find the pins. Hi, some of the electronic components that you have here I cannot find the same models that you use in your build. If you could provide a link to where you bought the electronics from I could finish the build. Hi, I get all electronics from china, try aliexpress. what is the total cost of making it ? It depends on your suppliers and shippiing costs, probably 399 USD to 599 UDS.